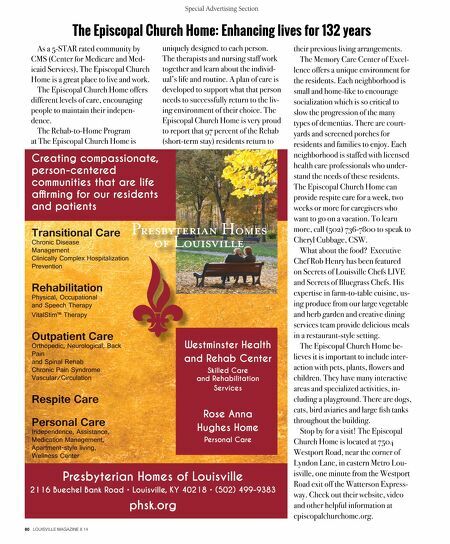 80 LOUISVILLE MAGAZINE 8.14 Special Advertising Section www.phsk.org As a 5-STAR rated community by CMS (Center for Medicare and Med- icaid Services), The Episcopal Church Home is a great place to live and work. The Episcopal Church Home offers different levels of care, encouraging people to maintain their indepen- dence. The Rehab-to-Home Program at The Episcopal Church Home is The Episcopal Church Home: Enhancing lives for 132 years uniquely designed to each person. The therapists and nursing staff work together and learn about the individ- ual's life and routine. A plan of care is developed to support what that person needs to successfully return to the liv- ing environment of their choice. The Episcopal Church Home is very proud to report that 97 percent of the Rehab (short-term stay) residents return to their previous living arrangements. The Memory Care Center of Excel- lence offers a unique environment for the residents. Each neighborhood is small and home-like to encourage socialization which is so critical to slow the progression of the many types of dementias. There are court- yards and screened porches for residents and families to enjoy. Each neighborhood is staffed with licensed health care professionals who under- stand the needs of these residents. The Episcopal Church Home can provide respite care for a week, two weeks or more for caregivers who want to go on a vacation. To learn more, call (502) 736-7800 to speak to Cheryl Cubbage, CSW. What about the food? Executive Chef Rob Henry has been featured on Secrets of Louisville Chefs LIVE and Secrets of Bluegrass Chefs. His expertise in farm-to-table cuisine, us- ing produce from our large vegetable and herb garden and creative dining services team provide delicious meals in a restaurant-style setting. The Episcopal Church Home be- lieves it is important to include inter- action with pets, plants, fowers and children. They have many interactive areas and specialized activities, in- cluding a playground. There are dogs, cats, bird aviaries and large fsh tanks throughout the building. Stop by for a visit! The Episcopal Church Home is located at 7504 Westport Road, near the corner of Lyndon Lane, in eastern Metro Lou- isville, one minute from the Westport Road exit off the Watterson Express- way. Check out their website, video and other helpful information at episcopalchurchome.org.